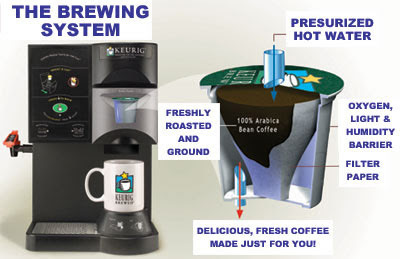 Maximizing Progress: Brewing Profits ~ The Keurig $2B Buzz Machine! "Unlike the drip models already on the market, [co-founder and inventor] Sylvan’s machine would brew single cups using sealed capsules of ground coffee. 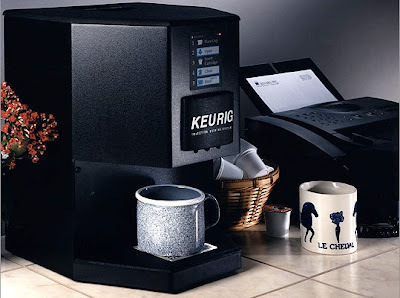 From Keurig’s founding in 1992 until their departure in 1997, Sylvan and [co-founder] Dragone hacked together prototype after prototype, working in small offices in Waltham and doing most of the taste-testing themselves. For the first few years, they drew no salary and were turned down for funding by scores of venture capitalists. But today, [16 years later] the company Sylvan dreamed up is a billion-dollar juggernaut. Keurig’s commercial models are now in 13 percent of American workplaces (and more than 25 percent of those in Boston). Last Christmas, one out of every four home coffee makers sold in the United States was a Keurig. Lately the brand has taken on a viral quality: If someone gets a machine and shows it off to friends, soon everyone else in the neighborhood wants one, too." Read the rest of the story! And FYI, here's the working innards... Also definitely check out Scott Kirsner's 2010 piece, An environmental quandary percolates at Green Mountain Coffee Roasters.